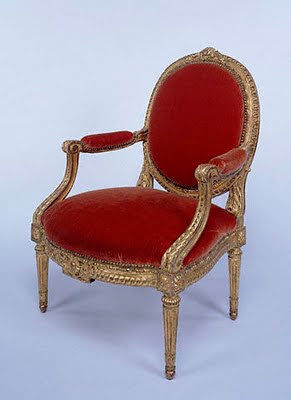 Louis XVI Chairs came in a variety of shapes and sizes in eighteenth-century France, with carving frequently matching that on other pieces of furniture such as Italian Console and Mirror , settees, French mirrors, or the wood paneling. By the 1700s two types of chairs had developed for formal and more relaxed seating arrangements. Chaises furnishing chairs were designed without carving on their backs and were arranged symmetrically against the wall around the sides of a room. Chaises - running chairs could be moved around a room and were designed to be seen from all sides. This set of antique living rooms consist of four antique French chairs and a settee ( 3 seat sofa ) was designed to be arranged against a wall. The antique wooden frames are fairly massive, yet the carving of the decorative elements is extremely fine. The decoration incorporates such Neoclassical motifs as crisp acanthus leaves, egg-and-dart molding, and straight, fluted legs. Kindly have a look at my work available on line at: www.paklinks.com. My work is there on this link in the Section of "Classified Adds" by the name of "world of Oriental arts- Add beauty to your home". Please have a look at that and let me know how did you find that. 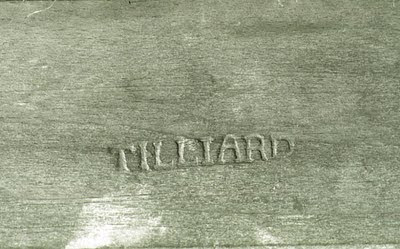 Is each piece stamped Tilliard or is it just on the Settee? I wish the underside construction could be photographed with each article to help educate people like me that would like to know more about time period identifiers. I am intrigued about this style of furniture. 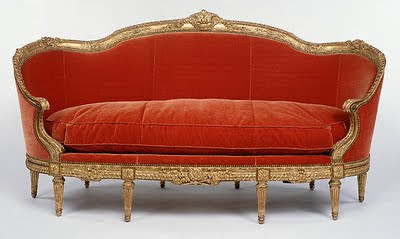 QUESTION: Did the artisans that carved furniture ever leave signiture identifier hidden within their work?